If cracks, sags and leaks in a weekend getaway blueprinted by a masterbuilder dont bother you, skip this story. Edgar J. Kaufmann would have. The Pittsburgh department store tycoon never even minded that four concrete floors jutting out from his vacation house over a waterfall were in danger of collapsing from the day they went up in 1936. That wasnt all he didnt mind. During construction, a concrete bridge across the creek from the house had to be rebuilt four timespushing the cost from $2500 to $30,000. And because of problems within the house, parts of it had to be re-done before Kaufmann could move inmore than doubling the cost: from the estimated cost $30,000 to $70,000. This is not a case of tarpaper roofing flapping in the wind. This is the rise and fall of a monument, a concrete Titanic, each floor a deck that wasnt supposed to sink. This is Frank LLoyd Wrights masterpiece, voted the best building of the 20th century by the American Institute of Architects. New Yorks Museum of Modern Art mounted photographs of the house for an exhibition in 1938. Architectural Forum published them. Time magazine also featured the house. The history of this house is both glorious and shameful. An $8.1 million restoration of the house, donated to the nation by the Kaufmann family in 1963, is necessary to salvage it. There were also other problems that Kaufmann abided in his waterfront home: no one could swim from it, launch a boat from it or even look at the waterfall from it. Clearly, he looked the other way a lot. A note Wright penned to his patron suggests he cowed him: "I dont know what kind of architect you are familiar with but it apparently isnt the kind I think I am. You seem not to know how to treat a decent one. I have put so much more into this house than you or any other client has a right to expect that if I havent your confidenceto hell with the whole thing." In the many photographs of Wright through his 91 years, his is a pose of Olympian detachment, head held high, as if sniffing something. By the tenor of his note to Kaufmann, one imagines his patrician nose pinched white with resentful rage at some presumed complaint from Kaufmann. At first, Kaufmann answered in kind with a well-measured response: "I dont know what kind of clients you are familiar with but apparently they are not the kind I think I am. You seem not to know how to treat a decent man. I have put so much confidence and enthusiasm behind this whole project in my limited way, to help the fulfillment of your effort that if I do not have your confidence in the matterto hell with the whole thing." But Kaufmann blinked first, and ended the standoff in a post script in the same letter: "Now dont you think we should stop writing letters..."
His tolerance of Wright can have one blinking in astonished silence, considering what was known about him at the time. It was common knowledge the architect was a deadbeat who drove fancy cars, and seldom finished a project on time or on budget. His womanizing made him a kind of Gary Condit of his day, but thats another story. Living beyond his means and being in constant debt also may not be relevant here. But Wrights god-complexdefined by architecture critic Lewis Mumfordmay be the big reason Fallingwater has been falling for more than half a century. Mumford said, "He lived from first to last like a god, one who acts but is not acted upon." 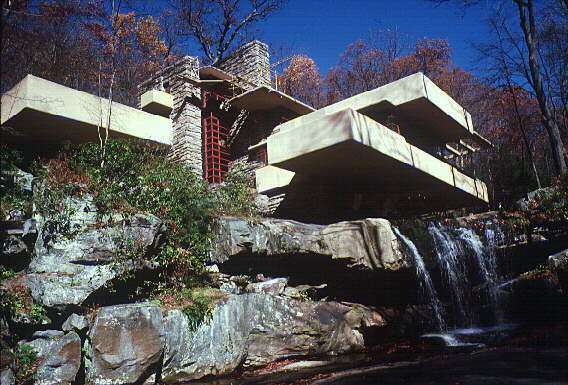 Which may account for why Wright ignored advice from the engineering firm that supplied the slabs for Fallingwater. Engineers told him there werent enough steel bars in the beams to balance the tension. Scientific American reported in January that load tests indicate stress in the slabs are past margins of safetysomething Wright was told from the start. Given to ignoring thinking that wasnt his, he also pooh-poohed building codes. In a recorded talk to aspiring architects at Taliesen (Welsh for "shining brow), Wrights school in Spring Green, Wis. in 1953, he said "A code is a series of rules and regulations made to be foolproof but succeeds only in being rules and regulations for fools." Wright took control of everything in a building he designed, down to the napkin rings and the woman of the houses hostess gown. Once, he even picked the breed of cow for its color: Guernsey because its tan and matches the land better than a black and white Holstein. He also sought control over his students. Edgar Tafel, a former apprentice at Taliesen, noted in his memoirs Wrights resentment of anyone who left him. He wrote to Tafel in 1942, who, by that time, was married and about to become a father: "Somehow I regard the advent of another Tafel in the world as of inferior consequence compared to a Tafel able to carry on a work in the world of loyalty based upon right-minded ideas instead of selfishness." As Tafel said, "He made you feel as though you had left the Catholic Church." Maybe Wright knew he needed his students. "He was a great architect," said Tafel, "but he needed people like myself to make his designs workalthough you couldnt tell him that. If something didnt work when sketches were made into building documentssay a stair didnt reach the second flooryou didnt say it didnt work because Wright would argue that it was fine. But if you said, Gee, I have a problem with getting the stair to go to the second floor, hed say, Well, we can fix that, and hed fix it." Given Wrights personality, its not unexpected that Maria Consantino reported in her 1998 biography The Life and Works of Frank Lloyd Wright, that Fallingwater wasnt the only house in disrepair from the start. "By the time he was halfway through with it," she said, "youd find out that the price had doubled, or quadrupled, and that the local rocks or sand or gravel or whatever he was using to blend in with the surroundings was totally unsuitable, so one side was crumbling down as the other side was going up." Kaufmann first hired Wright to design an office in his store on the beseeching of his son Edgar, a wannabe architect at Taliesen. Wright was 69 then and considered washed up. His reputation for arrogance kept him from getting commissions. This, despite making history with his Prairie designs, which rid mid-west homes of damp basements and put living quarters above ground level to allow prairie views. When Kaufmann showed Wright his woodland retreat over the waterfall, he took the architects request for topographical maps as a sign of interest. But he heard nothing from him. Wendy Buehr Murphys 1991 biography Frank LLoyd Wright reports that the architect had "shoved the project aside and forgotten about it." Finally, Kaufmann called to ask about the progress of Wrights plans. Tafel remembers the architect telling Kaufmann, "Come right along E.J., were ready for you," even though he hadnt drawn a line of Fallingwater yet. An hour and forty minutes after Kaufmanns calljust in time for his arrival the drawing was ready. No one can argue Wrights genius at Fallingwater. All of its past glory is still there. In the words of architecture critic Paul Goldberger, who has witnessed it in recent years, "Like any kind of great art, it ultimately takes you somewhere that words cannot take you." Goldberg compared it to Chartres cathedral. But theres a difference, of course. The centuries-old Chartres doesnt need $8 million worth of structural repairs.